Items that are useful when outfitting The Flash in Arena of Valor. Includes a number of example builds to give an idea of how some sets of items can work together. These items are necessary in order to play Hero optimally. Only diverge from a core item if you are a very experienced player or you have a very good reason for doing so. Rhea’s Blessing As someone who will constantly be right up on enemies, The Flash needs a bit of defense to stay standing. Rhea’s blessing gives him a bit of regeneration through its magic lifesteal and a shield to give him a bit of extra time to escape when the fight gets too rough. 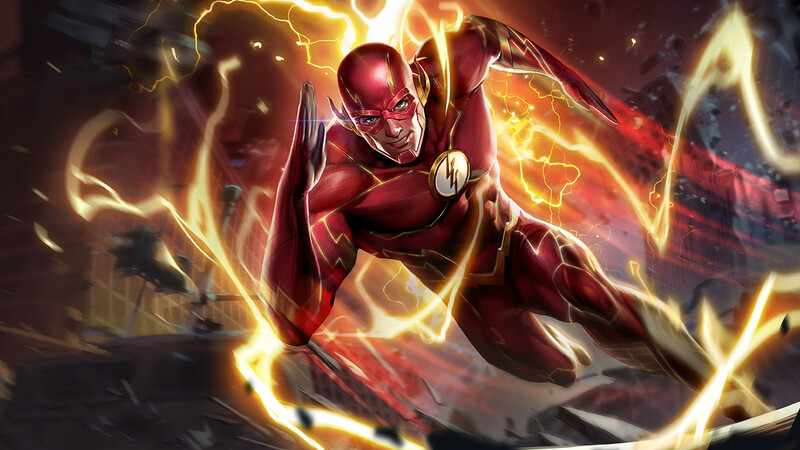 The cooldown reduction it provides is also well welcome to The Flash, making his abilities more readily available in fights. Apocalypse Apocalypse stacks very nicely with Sonicboom, especially right after a use of Super Speed. The on-hit effect isn’t a compromise to stats either, the item offering more than adequate amounts of ability power and even some cooldown reduction. A perfect fit for the burst assassin gameplay that The Flash will be trying for. Hecate’s Diadem It comes up a lot on these lists, but Hecate’s Diadem really is an indispensible item to damaging mages. The amount of ability power that it offers cannot be overlooked, especially at its price point. Orb of the Magi While less of a necessity on The Flash, Orb of the Magi can still be a great item on him. It offers great stats both for survivability and damage, the on-level regeneration effect a great bonus to keep the holder in lane. However, some would rather rush to Rhea’s Blessing so that they can get to other, faster sources of damage. The Flash does best in the early-mid stages of the game and thereby can not benefit as much from Orb of the Magi’s timed bonuses. Soaring Aura The Flash gets right up next to enemies he engages, so his targets will always be in range of Soaring Aura’s defense slashing effect. The extra health it provides along with its ability power is another great boost as well, The Flash needing every scrap of survivability that he can get. Boomstick While not offering the best synergy with The Flash’s abilities, Boomstick can still be a nice addition to his kit. Not only does it offer a significant amount of ability power, the damaging explosion can make his attacks exceptionally more lethal. Berith’s Agony The Flash isn’t going to be using the item’s passive too much, but the combination of stats that Berith’s Agony provides can be a nice addition to his arsenal, offering ability power, armor, and cooldown reduction. Even though his kit doesn’t offer regular use of the health slashing passive, it still will put a nice bit of additional damage into his attacks, especially when facing high health foes. Holy of Holies Practically any mage can benefit from the immense amount of health and ability power that Holy of Holies offers and The Flash is no exception. Holy of Holies is a natural end-game choice for the assassin. Frosty’s Revenge While not his first pick, Frosty’s Revenge can offer The Flash some nice utility. The item’s signature slow is very helpful when wanting to stick to otherwise slippery enemies as well as giving the assassin a bit more value in team fights. In addition, the movement speed the item offers will not only help The Flash stick to enemies, but will allow him to charge up stacks for Sonicboom more quickly. Finally, the resistance that the item provides will help The Flash along in his quest to not get destroyed from afar by enemy mages. Gilded Greaves These are extremely valuable to The Flash as he is very vulnerable when stunned. They are less of a necessity when the enemy team is light on crowd control or magic damage, however. Enchanted Kicks Enchanted Kicks are good when wanting to throw caution to the wind. The extra magic pierce they provide will help ensure that enemies feel the full force of The Flash’s lightning quick attacks. Here we play The Flash in the middle lane, building him to be an aggressive assassin in the game. He will have enough survivability to survive trades with his opponent, Orb of the Magi, Rhea’s Blessing, and Holy of Holies all giving him some defensive bulk. Meanwhile, he will have a very large amount of ability power at his disposal. Each of the more defensive items also increase his killing potential while Hecate’s Diadem pumps up their ability power contributions further. Apocalypse brings all of this ability power as additional damage to one of his attacks. If used in conjunction with Sonicboomb, The Flash will be capable of extremely potent bursts of damage. While great in the middle lane, The Flash is also a capable jungler. As Loki’s Curse stacks with Apocalypse, the combination will allow him to punch for incredible amounts when mixed with Sonicboom. We focus more on magic pierce here as well, The Flash facing less opposition when sneaking through the jungle. Soaring Aura will cut the magic defense of all around him while Enchanted Kicks and Hecate’s Diadem allow him to ignore some of what’s left. This build takes a more defensive approach, giving Flash a bit of utility instead of focusing completely on damage. Perhaps your team already has enough damage, or the enemy team has a hero that really needs to be slowed (*cough*Superman*cough*) Frost Cape and Frosty’s Revenge slow down those caught by The Flash’s abilities, leaving them open and defenseless to allied attacks. Each item, with the exception of Hecate’s Diadem, enhances his defense in some way, making The Flash deceptively tanky and thereby able to stay up and ready in fights.